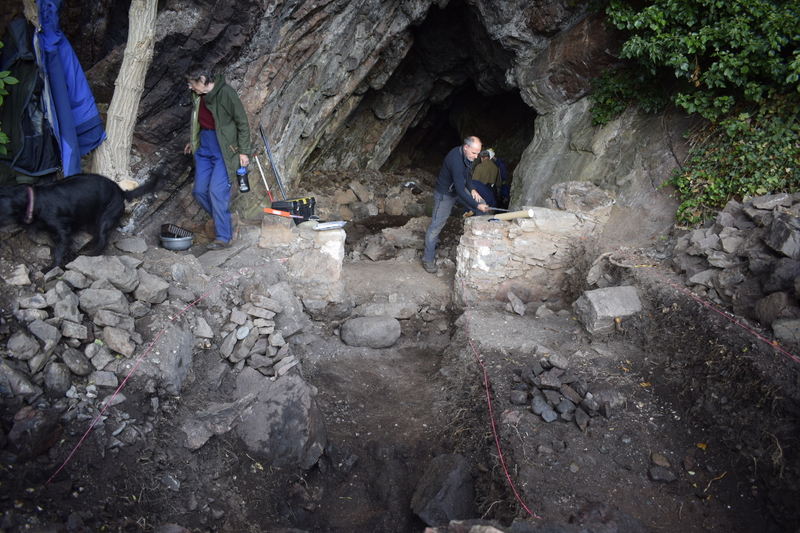 2017 saw a second consecutive season of excavation by the Rosemarkie Caves Project in the series of coastal caves between Rosemarkie and Eathie. 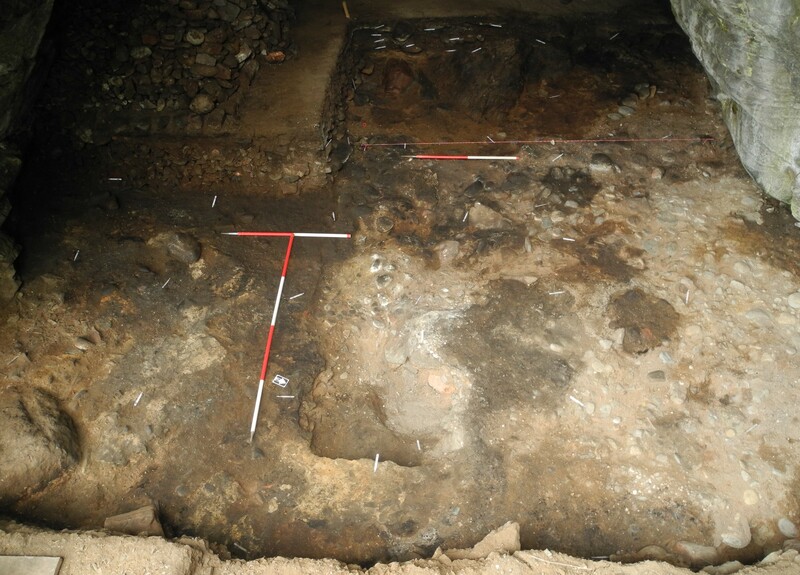 Four caves were chosen for targeted excavation by the team. 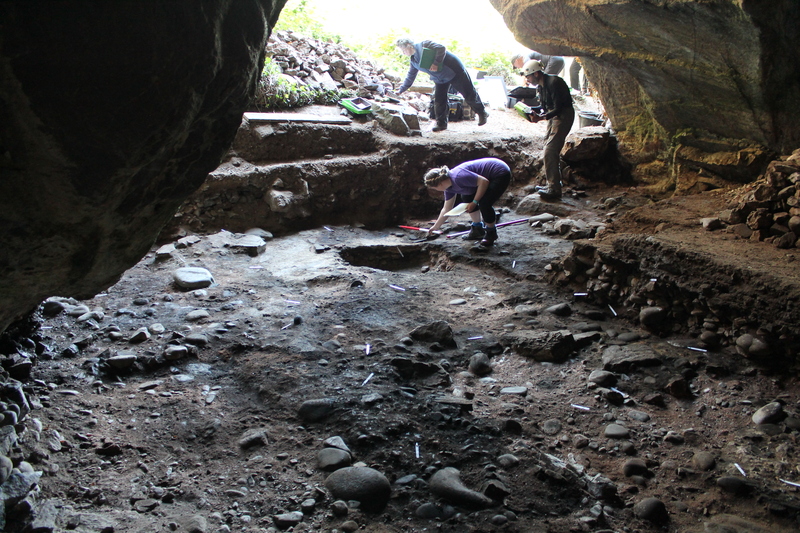 This included further work in Smelter’s Cave (2B) where the Rosemarkie Man discovery was made last year (see blog post), along with substantial evidence for early medieval metal working . 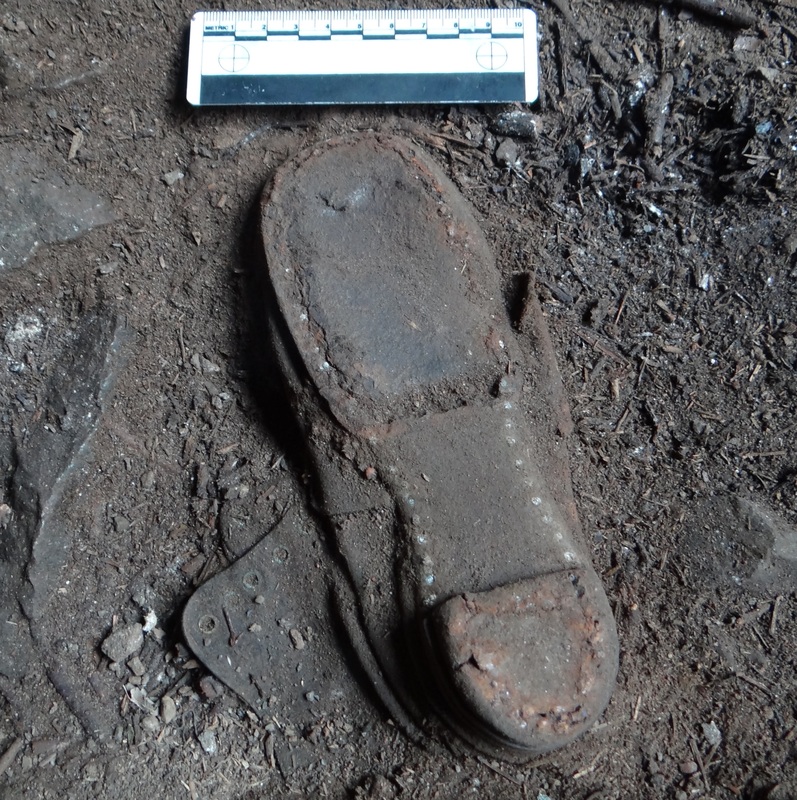 Some of the best evidence for the use and function of the caves to emerge this year related to the 19th century, including the usual leather shoe soles and leather off-cuts, snips of metal, and working in bone/horn. 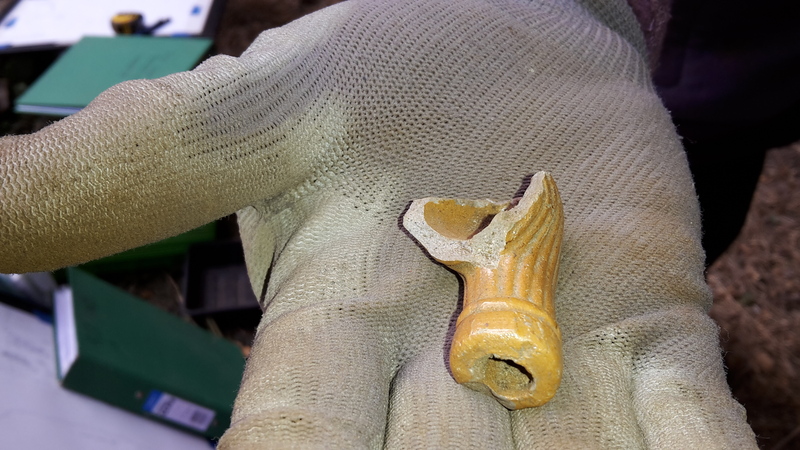 We also recovered good economic evidence for the use of the caves during this period, which once analysed, will provide some detail with regards to how the people lived and what they ate! Above: A child’s leather boot in situ. 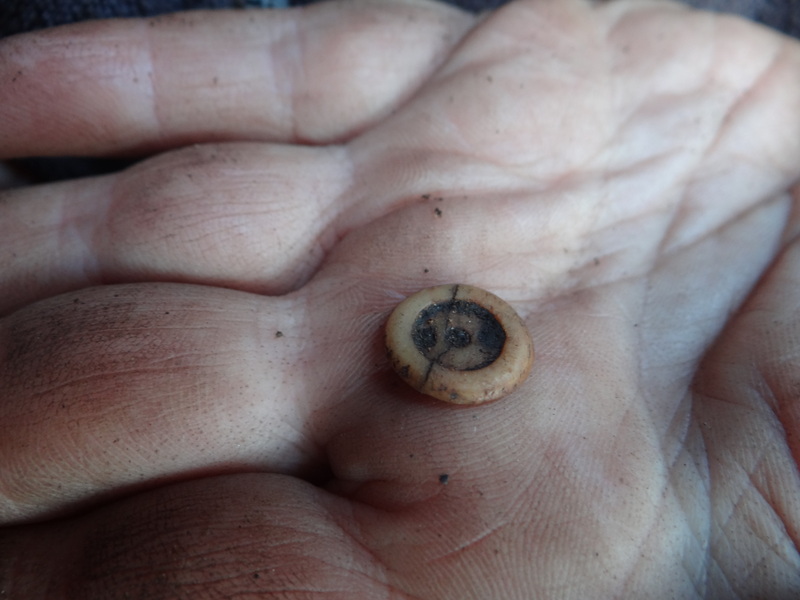 Below: A 3 holed bone button. Probable 19th C. artefacts from Cave 1B. Unfortunately, the hard work to uncover further evidence of the metalworking activity outside 2B failed to materialise…..here, we found evidence for the deposition from material generated within the caves through time such as fire-cracked stones, charcoal and ash, shellfish, animal bone (cattle, sheep and pig) and some large fish (including cod and ling). This area, below the drip-line of the cave, was also probably quite a dangerous place to carry out any activities. A number of large rocks were uncovered here that had fallen from the cliff above. We did recover some metalworking residues including a hearth base, three pieces of iron slag, and one fragment of vitrified furnace wall. This entry was posted in Black Isle, Excavations, Post Medieval and tagged 19th century shoemaking, Archaeological dig, archaeology highlands, BBC interview, Black Isle archaeology, bone button, cave archaeology Scotland, cave burial, cave excavation, cave occupation, child's boot, Cist Burial, cow burial, Landward, metal working, North of Scotland Archaeological Society, Picts Rosemarkie, Post Medieval archaeology, Rosemarkie archaeology, Rosemarkie Caves Project, Steve Birch on September 27, 2017 by nosas.